Featured / Recipes / 14.02.2016. Pancake is a thin batter cooked in a frying pan and is typical for the countries of Central and SouthEast Europe. It can be prepared thin or thicker, with various kinds of flour, with added grated potato or carrots and the stuffing can be sweet or salty. Pancakes can be prepared au gratin, fried in breadcrumbs or flambéed, and for those reasons they can be a simple meal or a supreme dessert. Whisk the egg and sugar. Gradually add sifted flour and milk until you get a smooth liquid batter. Heat up the frying pan well, add some oil and pour the batter with a ladle to cover the bottom of the frying pan in a thin layer. After frying briefly turn the pancake with a little spatula and then fry some more. Move the pancake onto a plate. If needed, add some oil and continue to fry the pancakes until all the batter is used. 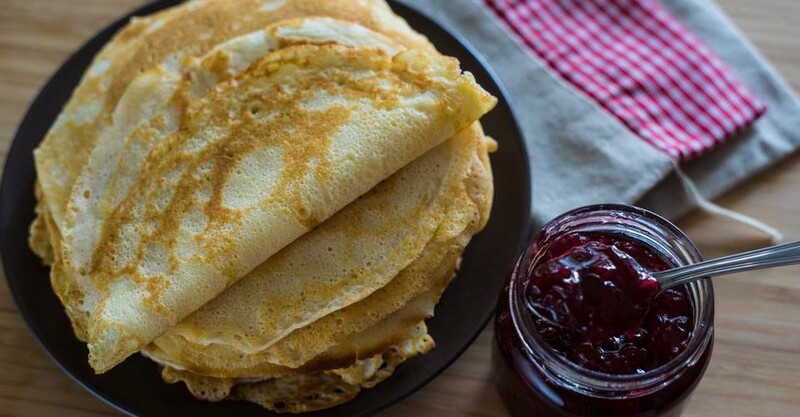 Pancakes can be sprinkled with cocoa, jam, marmalade or melted chocolate. This basic batter for pancakes can be used in preparing salty dishes as well. If your frying pan is 24 cm in diameter, this amount of batter should give you about 12 pancakes, and if it is 28 cm, you get 6 pancakes.